IMF: So you recommend this band to me, when did they come on to your radar? Season: A few months ago from my dear friend Lyle Hysen who reps the band for Film/TV licensing. IMF: What was it about their album or sound that grabbed you? I’ve got A Teenager In Love playing in the background and I’ve gotta admit, its damn catchy. Season: A Teenager in Love was the first song on the album that grabbed my attention. I love how bouncy and fun it is, and of course the 80’s throwback! Can’t go wrong! IMF: I’m hearing a lot of throwback these days. How would you use a song like that in any of the projects you’re working on? If I were wearing my supe hat, I’d pitch for a montage scene with two crushes falling in love? IMF: Maybe a pool party scene? Season: First few listens it reminded me of that Mandy Moore movie Saved where she played the crazy religious girl. This seems like the perfect anthem for some teenager professing their love to “Jesus Christ In Heaven”. Hilarious! IMF: I could see that. Their self-titled album is out now on Slumberland. Want to hear more of them? 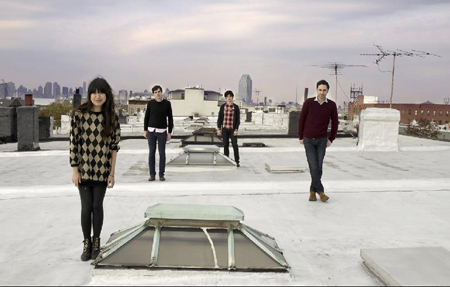 Check out their video for ‘Everything With You‘ on Indiemusicfilter.tv. Or you could catch them on the road, check their myspace for details. Counting the dates, I will have 11 chances to see this band live (10 sxsw dates, 1 Toronto date April 28th, Lees). Pretty good odds I’ll see them at some point. Originally from Tennessee, Season Kent is a music supervisor living in Los Angeles who has worked on such films as ‘Harold and Kumar Escape From Guantanamo Bay’ and ‘The Strangers’. She’s got a solid ear for the up-and-coming bands and also responds to the name ‘Caesar’ (as in many personal introductions, her first name is misheard).